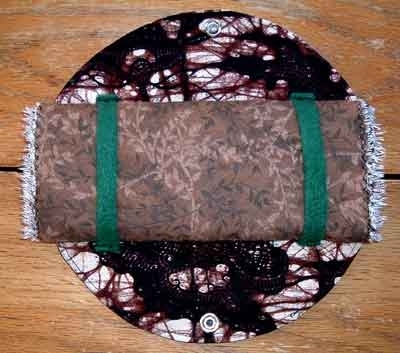 This is for a layered 7.5 inch diameter pad with PUL liner. Just print onto heavy cardstock and cut it out. Leave no seam allowance. To make the band placement a bit easier, punch small holes at each corner of where the bands are marked on the pattern, and where the snaps are marked. Honestly, this pattern is pretty straight forward. And if you have made any of the other patterns I've made, this one will be a snap. 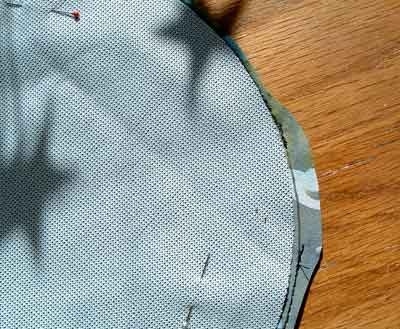 two pieces of regular flat cotton (think quilting fabric, or even cotton bed sheets.) Both pieces must be at least 8 inches in size. One piece of PUL around 8 inches in size. Flannel in your chosen length and around 7.5 inches wide. (For my very heavy flow, I use the full length of flannel as it comes off the bolt, which is around 45 inches long. This makes a 'pad' around 1/2 inch thick.) But all means, adjust to whatever thickness you want. 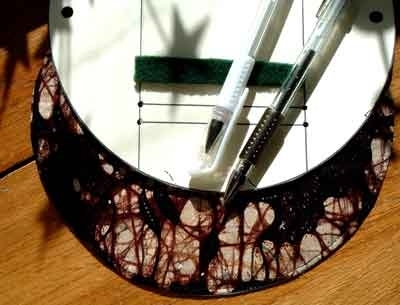 Take your cotton, PUL, and your pattern and trace the circle shape onto one of the cotton pieces, and onto your PUL. 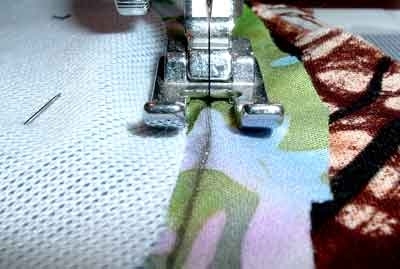 Line everything up, right sides in, and your PUL and pin in four places to ONE layer of the flat cotton. A few pin holes will not affect your PUL. 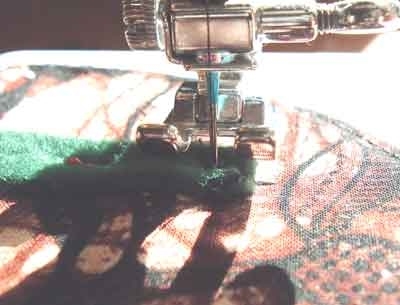 Sew directly on the line you made and leave a one inch gap for turning. Leave the pins in, and then turn inside out and smooth. Now you can carefully remove the pins. 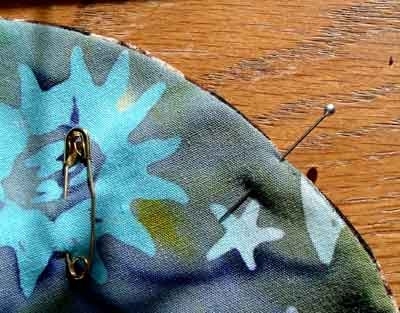 Tuck in the fabric at the place you left a gap and pin to hold in place. Iron if needed. 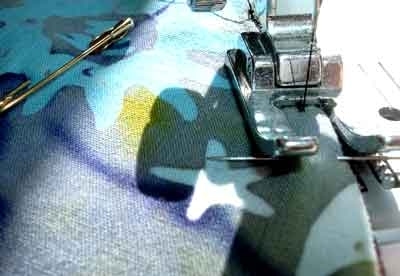 At the very least, a few sprays of water will smooth out the fabric nicely. (See photo) This shows the pad before I spray and smooth it out. It's well worth taking the time to do this step. It makes the pad look nice. Top stitch 1/8th inch away from the edge all the way around. 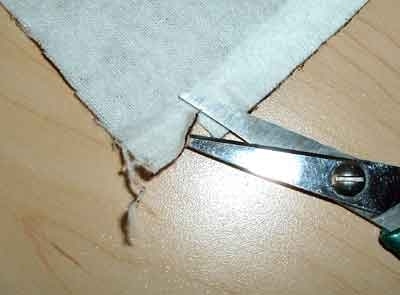 If done carefully, this will close the gap so you don't have to hand sew it closed. Then place the pattern over the cloth circle and mark where the bands are placed, and while you are at it, mark the snap placement too. 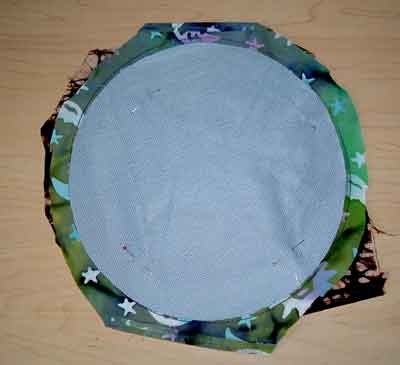 Cut and pin your bands to place on the cloth circle and sew. Make sure to sew back and forth a few times so they don't pull out. You can set your snaps at this time. Decide what length flannel you need. (You can always cut it down later if it's too thick, or even fold two or more together if it's too thin.) 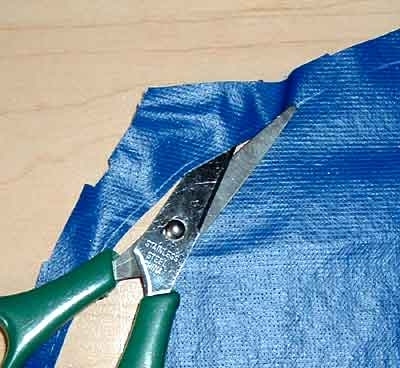 Then snip at the flannel's edge and tear across. This will give you nice even straight edges. Zigzag around the edge, or serge if you like, to prevent fraying. Cutting with pinking shears wouldn't last too long, as flannel is very loosely woven. 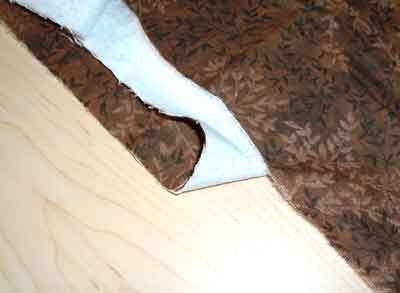 Cut your poly fleece strip, and then fold and put everything in place as it's shown below. 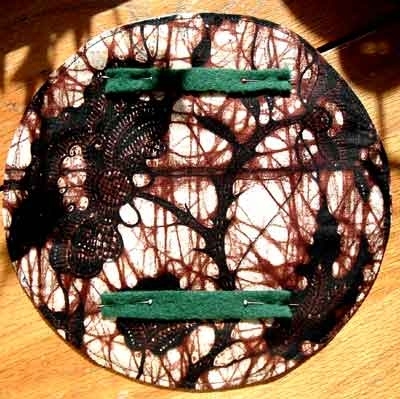 Ever since I started making cloth pads I have been looking for the one that would really work. I think it can go without saying that this page shows that I like sewing and tinkering with patterns. Even though, at this time in my life I just don't have the time, space, or money to make and use a stash of 40 to 50 pads. And that is what it would take for me to go though a period on nothing but all-in-one type pads. I never really gave it much thought before I started on cloth, but I apparently am a very heavy bleeder. In the past I have used super overnight pads and soaked clean though them in 20 minutes on my first day. So I had to have a cloth pad that would made it though my first few heavy days. Most patterns I've tried can't do that. They work great later on, the first really heavy bit, and I make a mess of myself. I will admit I did experience the commonly talked about, flow that gets lighter after switching to cloth, but I still bleed more than the average person. 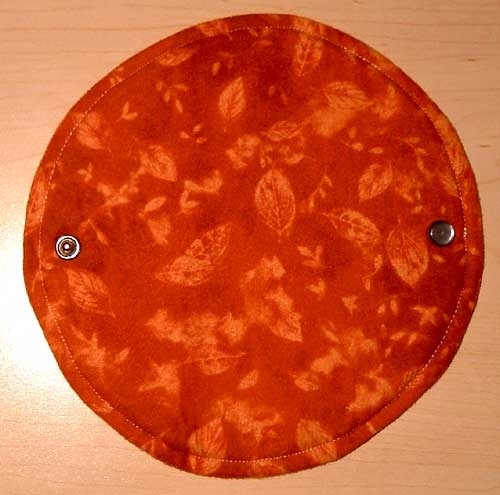 So with all that said, I needed a cloth pad that dried fast so I didn't have to make 50 of them, could be hand washed easily, and held back a flood. lol. I don't want much, do I? 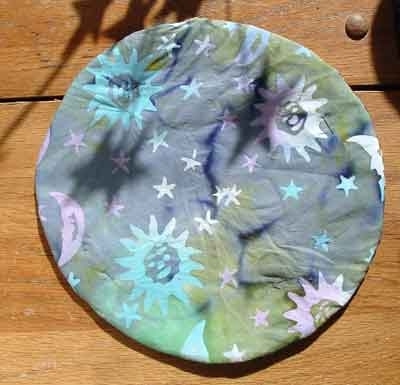 When I first saw photos of the circle pads being made by some of the ladies at diy_pads I never really thought they would work. Just looked too clunky and non form fitting. But I like to try anything once, and made one. This was the first circle pad I've made. terry, PUL, and one layer of flat cotton (bottom). After I tried it I was sold. They are so very comfortable! And when the sides fold in they make a wing unlike any other pad out there. There is no way they can leak! 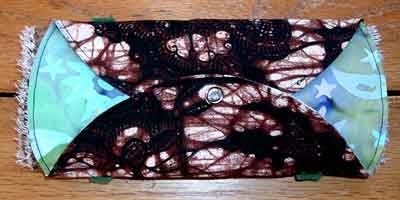 I then thought about the bands on the Luna pad which holds in their 'liners', and thought about the thin cloth that women of old used and folded to make whatever thickness they needed, and it came to me to put the whole thing together. 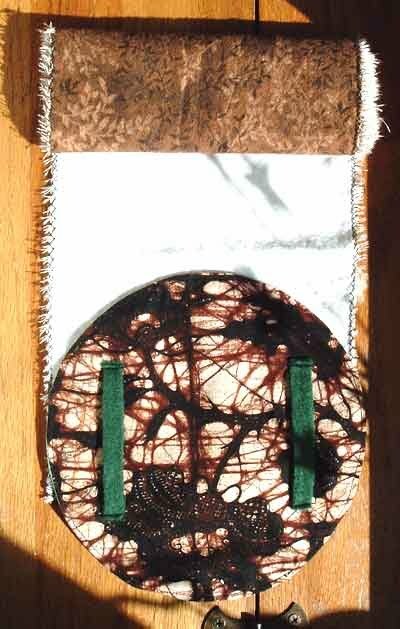 So I made another circle pad, but this time from just flat cotton with a PUL center. I then added the cloth flannel bands, and cut a very long strip of flannel and folded it and tucked it into the pad. So my washing procedures is: I keep a plastic tub (the kind yogurt comes in, it's the 4 lb size.) I keep it full of plain water and whenever I finish using a flannel strip, I drop it into the tub and let it soak. The next time I use another flannel strip, I rinse and hang up the older strip and drop the newer one in with fresh water. This way I never have stinky wash water sitting around. If I am out of the house, I just take extra flannel strips and a few cheap zip top bags with me. I just store away the used strips till I get home. I then realized I could use smaller strips for later in my period, so this pad could work for literally any lady with any kind of flow. For those who dislike PUL, even that can be skipped, if you don't bleed heavy, and or check your pad often. I did find I still had one more problem, my flow still tended to wick down the side of the wings if I left them too long, so I found that if I cut a simple strip of poly fleece and place that between the circle holders and the flannel that problem was solved. And there you go, more than you ever wanted to know about my cloth pad habits. Since I really do think of this pattern as mine, I'd love to know what you think of it. Also, photos would be great. (Pretty pretty please??) 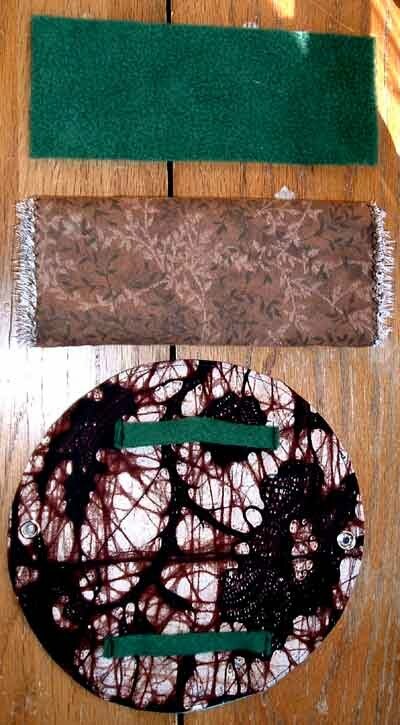 I am working on gathering up the ones I have been sent to so far to make a gallery of pads made by other ladies.